We own a distinguish position amongst most trusted manufacturers and suppliers of White Chalk Powder. We carry a par excellence range of white chalk powder. 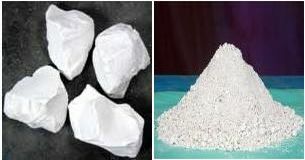 Our gargantuan mine has enabled us for bulk quantity production of white chalk powder. Despite the size of order, we never compromise on quality. Consistent quality delivery has facilitated us to be reckoned us as most promising white chalk powder manufacturers. We proffer rock bottom prices for optimum quality white chalk powder. Paints Industries: Used in ercoats,primers,distemper,glass putty,cement primer, etc. It is main ingredients in dry distemper and extender. Rubber Industries : it is very commonly used filler in cable wire, footwear and many Rubber products. Plastic Industries : it is use in pesticide formulation. Other Uses : Use in construction chemical,foundry,welding rod and many other industries.